UNITED NATIONS, November 14 -- Opposition leaders often ask to meet with Ban Ki-moon, because he is Secretary General of the UN. Sometimes Ban meets with them: when is not clear, nor why. This just took place in Bangladesh, where Khaleda Zia told Ban "Bangladesh’s democracy is now under threat following the scrapping of the non-party caretaker government system. She sought the United Nations’ due role to this end as the UN plays an active role for establishing democracy in member states." Based on this report, Inner City Press asked Ban's spokesman Martin Nesirky for the UN's read-out of the meeting. Nesirky claimed he had just spoken about it. 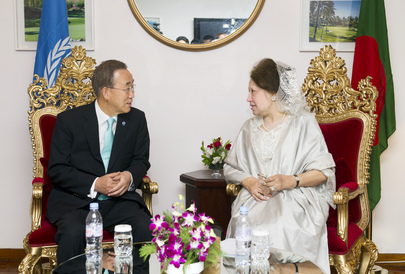 But all he'd said was "the Secretary-General also met with Khaleda Zia, the Leader of the Opposition, and he also visited the International Centre for Diarrhoeal Disease Research." Inner City Press: it’s reported in Bangladesh that the Secretary-General met with this Khaleda Zia, the opposition leader, and her readout of the meeting is that they discussed that the scrapping of the non-party Government has led to a a deficit in democracy, asking for UN help and about this international crimes tribunal they’re setting up. So, I wondered, what did the Secretary-General have to say to the opposition leader on the idea of democracy being going down in Bangladesh? What’s the UN’s role? Spokesperson Nesirky: It wasn’t just reported in Bangladesh, I just read it out, Matthew, so it is reported here in New York as well. Inner City Press: So what is the UN going to actually do? Spokesperson: So I think what we’ll see is a readout a little later, but I don’t have it now. A full seven hours later, there was no read-out, beyond a photo. Is it because she's with the opposition? What DOES the UN do in Bangladesh? If the UN can't answer this simple question when the Secretary General is in the country, when can it? Watch this site.